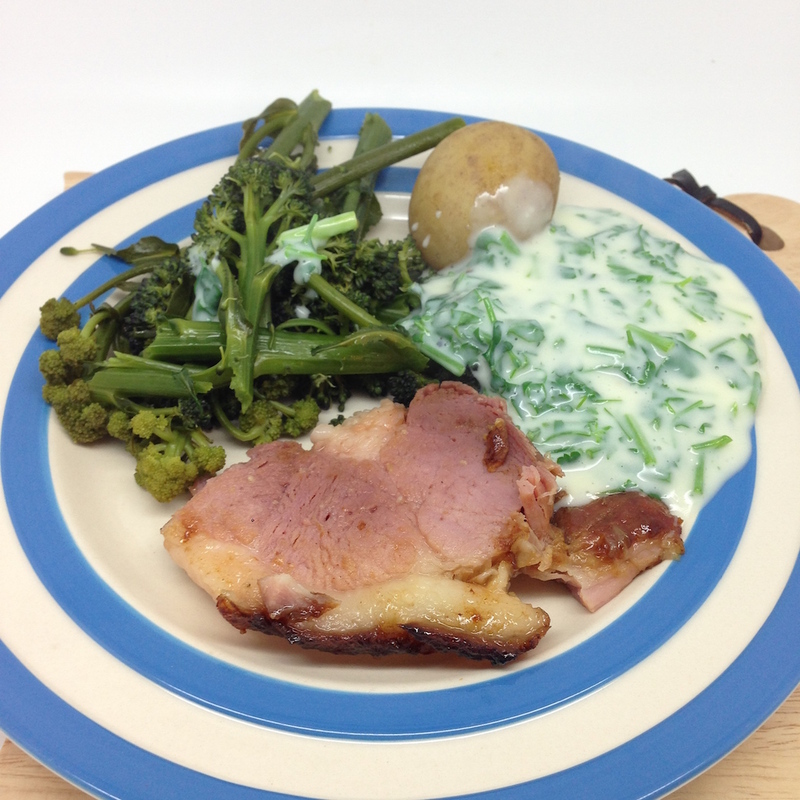 Take one cured, smoked leg of pork – in our case a bit of one of our Large Blacks from last year. Put in a large pan, cover with water and boil for a couple of hours. If you are more together add in a halved onion, celery, some carrot and aromatics. I didn’t. After boiling it, cut off the skin (chop into little bits and use as treats for the doggies). Mix up a paste with dark sugar, mustard powder, a little corn flour and water. Score the fat of the ham and spread over the paste. Roast for about 30-45 minutes. 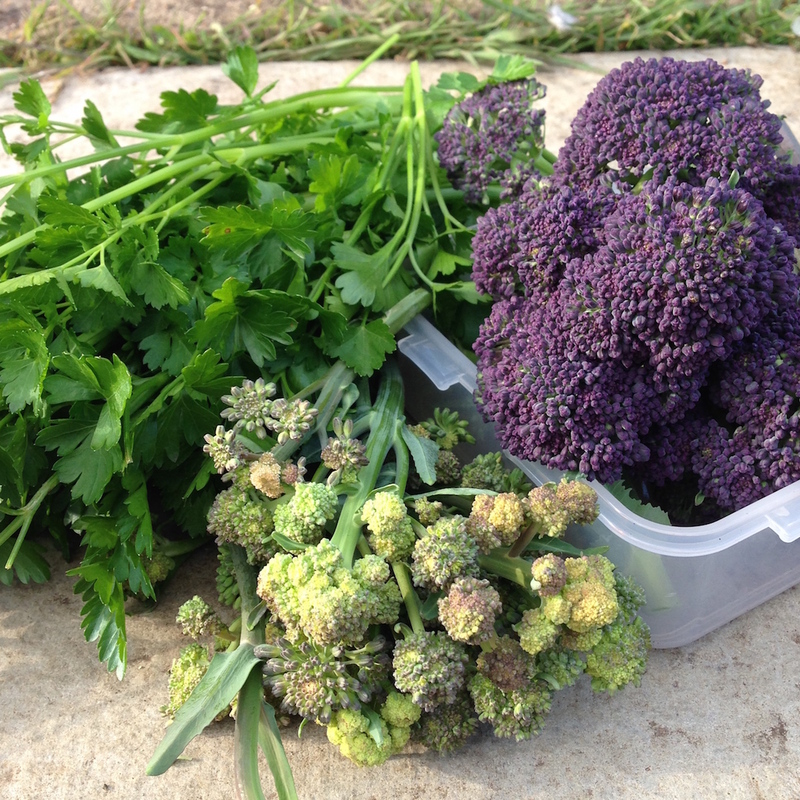 Meanwhile pick some white and purple sprouting broccoli (smug little dance here – I can’t believe I have actually grown white sprouting broccoli – see here for last year’s post on my neighbour’s wsb). Also pick some of the masses of parsley that is currently overtaking the strawberry bed. Make a bechamel sauce, add in the parsley. Boil some potatoes and serve a lovely consoling dinner for everyone who is working so hard giving the food truck a new lease of life, building the toilet block and tidying up our rather chaotic campsite – thank you.